Home » Financial News » Right for Renting? Rental costs in some U.S. cities may be unsustainable for many households. Cost of living has a big impact on a household’s ability to maintain financial stability. High median rental costs in many urban areas are making it tough to make ends meet. It’s certainly no secret that rental costs around the country are increasing. As Consolidated Credit has reported, in some urban areas it’s now more affordable to own a home rather than rent. However, the initial investment and upfront cost of becoming a homeowner often makes it tough for renters to get into a home where they live. So if you can’t make the investment to buy or you’re one of those families who simply prefers to rent, are you at least living in the right place to make renting a viable option? 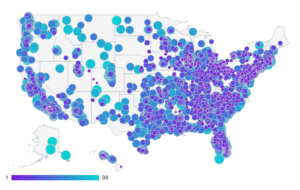 The map you see above was created using rental data from 50 cities around the U.S. The study was conducted by GOBankingRates, assessing the median rental costs for a 1-bedroom apartment with average square footage. They also included basic utility costs and gave each city a walkability score to rank to find the most affordable places to live as a renter in the U.S. Consider that the average annual income in the U.S. sits at $66,877 and housing costs usually take up roughly one third of a household’s budget. When housing costs are higher, it makes it tough to achieve and maintain financial stability, leaving families to rely on credit cards to get by. This could be a contributing factor to why American credit card debt is set to top $1 trillion by the end of 2016. In high-cost urban areas like Miami and San Francisco. Median rent in these areas is $2,000 and $3,600, meaning annual housing costs are $24,000 and $43,200 respectively. So Miami renters are using 36% of their income on housing costs, while San Francisco are using a whopping 65% of their income to cover housing costs – and that’s just for a 1-bedroom apartment! The solution for households who are struggling to make rent is to find a path to achieve ownership. However, this can be tough to do if rental payments leave little money to save up for a down payment and moving costs. So how can rental families get ahead of the curve? With that in mind, if you’re tired of throwing away money on rent – especially more money than you’d be paying for a mortgage – your first step should be to contact a HUD-certified housing counseling agency in your area to take advantage of a free consultation. They’ll look at your debt, income, budget and credit to get a full picture of where you stand and how you’d best be able to achieve ownership. For more information, call 1-800-435-2261.